Would you ask a Christian if you could replace the main sanctuary of his church with a synagogue? If not, then why should Jews allow a Mosque on the place reserved by God for His Holy Temple? And when God has tied world peace to the rebuilding of the Jews' Temple, on it's reserved place, on the Temple Mount in Jerusalem, this call for fair play is much more than that. It is indeed an imperative, our communal call for Divine mercy to descend upon all humanity, to finally remove the scourge of war from this blessed planet, and protect the lives of all innocent among the wondrous creations, built in the image of God, by the blessed Creator Himself. There are those who are for freedom of Jewish worship on the Temple Mount today. Jewish prayer groups just as there are Muslim ones. But in Talmudic Law, that movement is problematic for the following reasons. First if a place is reserved for one religion, to share it equally is an assault on the religion to whom the site is most holy. If no Church in Mecca or Mosque in the Vatican, then no Mosque on the Temple Mount either. Second, a more nuanced matter, while these Temple Mount activists mean very well, and are making a profound nationalistic political statement, and are trying to adhere to a great rabbi's opinion, not just doing only as they desire for nationalism. But as I have stated before they should not be going on the Temple mount for this activism. The majority of Rabbis say it is still forbidden for any human to go there until the Biblical methods of purification are reinstituted. They consider it an act of desecration, not holiness with each visit to the Temple Mount under current circumstances. By Torah Law, the halacha must follow the majority of the great rabbis of a generation. Therefore the activists, and we as a nation, should not rely on a minority view to represent a place where all of the eternal religious aspirations of our entire nation are focused on. I agree, it's important to claim it as our own. But rather than allowing only those who follow Rav Goren's heter (dispensation) to do the work for us, we need to find a way to do this together. If we find a common ground we can have a universal policy by religious Jews for the Temple Mount. The imperative to widen the Temple Mount movement is clear from both religious and political perspectives. The method of doing so, I suggest, would be for now to place a full blanket prohibition of any humans on the Mount for the time being. Now that most not just some Rabbis are saying that Moshiach (the messiah) is coming soon, it's not too much to demand this from the followers of Rav Goren, to temporarily close it down to all traffic for the sake of a unified policy and message. But this is only possible if it is clear we are doing this for God's honor, as told to the prophets of Israel. If we try to continue with the old policy of equal freedom of religion on the place of inner sanctum of the greatest of all synagogues, we are failing to keep our faith as God clearly intended for us. If we continue to fight as a small group of Maccabees, but in competing directions, politically we cannot expect to mirror the success of the Maccabees with such incredibly well intended but effectually contentious behavior. The Temple Mount prayer now movement is trying to fight the good fight, but it is not the rebellion against Hellenism it is intended to be. Effectively speaking, it is separation from the majority of rabbinical support, and thus a majority of religious Jewish support. Consequently, it is a part of the division of religious defense of the very Temple Mount rights it proposes to defend. But not from evil, only from an ineffective political stance, at the risk of angering a majority of the very religious constituency the movement requires in order to grow. By uniting to place a full blanket prohibition of any humans on the Mount for the time being, this new hybrid Temple Mount Movement could easily quadruple enrollment overnight. And without disrespecting the majority rabbinical position, many people of conviction would be enabled to step forth to join the new movement. One based on consensus building with that segment of society that would house the majority pool of ardent activists. To remove Divine wrath against the world that war may forever be removed from the Earth, we first need to remove the excuses and false fears that prevent us from making this a priority. And as making this a priority is guaranteed by God to usher in the era of world peace, to fail to do so should be recognized as a crime. To fail to do so should be recognized as an anathema to the project of the continued path of human enlightenment and world peace. We should do that which will bring humanity the Divine blessing of world peace, the building of the Third great Temple on the Temple Mount in Jerusalem. May it soon be so, B'Ezras HaShem Yisborach, by the grace of God. The Temple Mount is the holiest site in Judaism. So why does the government continue to deny Jews freedom of worship in their holy place. The government is still unfairly elevating Islam above Judaism on the Temple Mount and no wonder that God has given them Islamic countries to worry about. But this could change immediately for the better. There is a well known Talmudic dictum that the way a person judges others, they themselves are judged. (Sotah 8b) Before Iran became an enemy it was an ally. Before Israel gave the keys to the Temple Mount to the Muslim Waqf, it had an opportunity to first offer it to the Rabbis, or the Cohanim (priests), or even direct descendants of King David, the original purchaser of the Temple Mount. But the governorship was instead given to the Waqf. Measure for Measure, the forsaking of this, spiritually speaking, turned a friend into the worst of enemies. It began the spirit of the land for peace philosophy that has delayed peace in the region all these years. It created the spiritual foundation for the current predicament with the Islamic state in Iran and the rise of radicalism in the region. While there were dangerous nations before, the West had leaders who knew how to deal with Arab countries that endangered humanity. Now, the West is mostly confused on how to fix things. Israel conquered the Temple Mount, but quickly sought to surrender it. George W. Bush quickly conquered Iraq, but soon became overwhelmed after the victory. From a Torah perspective these events are not isolated from each other. If Israel would soon hand control of the Temple Mount to an appropriate Jewish authority, it would create a spiritual reversal of fortune that would soon find its way into the "real" world. It's a matter of destiny that it will happen, but how blessed would it be if it preceded the messiah and did not wait for him to occur. But I'm not settling for mere equal rights to the Temple Mount, for the causes are not equal. Muslims who pray on the Temple Mount turn their backsides to God's most Holy place on Earth, in order to pray to Mecca. They are there only to ultimately deny the Temple Mount's holiness, not embrace it. In their mind it is not that holy. They do not intend it as evil, but as for us, who are bidden to treat that place as the most sacred on Earth, how do we allow it? For this we're delaying a Third Temple? If they at least needed the Temple Mount too, it would not hurt as much, but they do not; not religiously at least. If the Knesset does not want to take responsibility for governing the Temple Mount directly, authority should be removed from the Muslim Waqf and immediately granted to the Rabbis or either the Cohanim or to the known descendants of King David, who in turn would hire Cohanim to man the holy site. The seal of world peace has long been revealed in Tanach. The Lord will first return the Jewish people to the Holy Land and in the time when the Third Temple is built, the wolf will lay with the lamb, and swords will be made into plowshares. This is guaranteed by the Creator. In the Book of Ezra, Cyrus, the Great, inspired by the prophecy of Daniel many years before, allowed the Jews the right to rebuild their temple on it's mount. Who can the Jews appeal to among the politicians in Israel? For all the good the government does, to make the return of Israel to the Holy Land more bitter than exile itself by denying the birth of the seal of world peace, the Third Temple, at the birth stool, is cruelty to their own people and those among the nations of the world who also yearn for peace. Hasbara for this can and should be done. And in fact it is guaranteed success if attempted. For true freedom of religion to exist in this matter, the Muslims must have their holy place in Mecca and the Jews must have their holy place in Jerusalem, on the Temple Mount, replacing the Dome of the Rock and the Mosque there. Anything less is not true freedom of religion for practitioners of both faiths in the purest sense. A few years ago Jewish Home MK Zevulun Orlev called for the rebuilding of the Jewish Temple. A couple years ago Housing and Construction Minister Uri Ariel also called for the rebuilding of the Temple. In other words, these members of Knesset believe that the threat of war is relative. The constant danger Israel is in is a greater threat than any potential violent backlash against removing the Waqf from authority on the Temple Mount. It's not worth worrying about such consequences, according to these members of Israel's government. But there is another layer to this. The enemies of Israel hate them no matter what, but if Israel stands up to the oppression and for their God given rights, they will surely receive Divine assistance the likes of which have not been witnessed for a long time. Just as Israel strives to cater to the religious needs of the gentiles living in the State of Israel, so too should they do so for the Jews who live in Israel. It is the right thing to do. And a host of Scriptural sources would encourage such a risk. Most investments are risks, and yet people make them all the time. But the best of intelligence sources, the Prophets of Israel, tell us that having a Temple is a protection, not a cause for fear. And the third Temple is a seal of peace, not a cause of war. The fear of battle at the time the Jews built the Second Temple was not due to the Temple being built, but for the settlement and building of Jerusalem itself. "And I saw, and I arose, and I said to the nobles and to the prefects and to the rest of the people, "Do not be afraid of them; remember the great and awesome Lord, and fight for your brethren, your sons and your daughters, your wives and your households. And it came to pass when our enemies heard that it had become known to us, that God had frustrated their counsel, that we all returned to the wall, each one to his work. (Nehemiah 4:8,9)"
If the Arabs are not attacking for settlement of the land, why would they attack for a holy place that is not truly one of their main holy places. They would not go to war only for that. And if they did it would only be a pretense. They already have all the pretext they need, because Jews love life, and the radicals of the Arabs love death. When they feel it's time for a battle, they look for excuses for a new intifada or battle. Remember when Ariel Sharon visited the Temple Mount and then an intifada began? The timing was right for an intifada or else it would not have amounted to much to the radicals. The government of Israel builds all the time, and only occasionally is there an attack. It's based less on what Israeli policy does, than on perceived opportunities to attack and internal Arabic war preparation timelines. But it is wrong to assume that it would start when people show the Creator respect. That is a fallacy, conceived in the heart of those who have little hope or trust in a higher power and beneath God's nation, the kingdom of priests, the people of Israel. It's only a matter of time until a government of Israel does what is right, and they can then share in the blessings of peace that will bring in it's wake. But the current Knesset has the opportunity decide if they will be that fateful assembly that will acknowledge the God given inalienable rights of the Jews to the Temple Mount in Jerusalem, as Cyrus, the Great, did long ago. May it soon be so, by the grace of God. For those residing chutz learetz, outside of Israel, I suggest voting for the Torah party in the World Zionist Organization Election. Here are some quotes and links related to this process. The voting goes through tomorrow (April 30, 2015) and it's for representation for Jews outside the land of Israel. Vote Online via this link! If you are at least 18 years of age, live in the US, and accept the Jerusalem Program, you are most likely eligible to vote. In the United States, the election is managed by the American Zionist Movement, the umbrella organization of Zionist bodies and the representative of the World Zionist Organization in the United States. Is Gaza an Israeli province with the Palestinian Authority as current governor, or is Gaza a land already given to the Palestinian Arabic people? I have presented the former perspective as the preferred interpretation of International Law, but it is easier to follow the latter perspective since you don't have to deal with Gaza to get it done. If the latter perspective on Gaza, that it is irrevocably surrendered, is established as Israel's foreign policy, then implementing Everyone Wins or a similar one state solution would focus only on Judea and Samaria for the time being. But what if I am right, that Gaza has never been fully transferred to another country? That then would do two things. First, it creates a legal mechanism for regime change of Hamas in Gaza without the need for concern of foreign complaints. It is an internal matter in Israel. Next, it would reveal a moral and legal liability to Israel for what Hamas does while on Israel's watch, urging immediate police action against Hamas rather than passively allowing the risk of their regime's existence next door to Ashkelon, Sederot and the other neighboring communities. My position is based on the concept of where is the other state? There is no Successor State. There has been no alternative UN member state that has accepted the Gaza Strip. The Palestinian Authority is not that yet, and by the grace of God, nor will it ever be. When it assumed control of Gaza, it did so as an entity, an organization more than a nation, and certainly not a member nation of the United Nations. Further the current regime is no longer the regime that Israel tried to give Gaza to. Fatah recently called for the destruction of Hamas. Hamas is clearly no longer a member of the Palestinian Authority which was the supposed Successor of the Gaza Strip. Hamas's control of Gaza has nullified even that. If you are familiar with the first chapter in Talmud Shabbos, this situation is likened to the concept of Hanacha (placement) and Akira (acceptance.) There was arguably (in the position suggested by some legal authorities such as esteemed Professor Eugene Kontorovich) a placement of the item (The legal evacuation from Gaza, under the International Law: "Session"). But to my knowledge there has been no mention that no member nation of the U.N. has received it as of yet (Succession). Thus we come to the startling realization that Gaza awaits acceptance as a full nation even today. I would go further still, that the Session of Israel leaving Gaza has already ended the moment Gaza became a fledgling terror state, nullifying the intent of the Session from Gaza by Israel that the act of leaving Gaza was predicated on. Thus it is a policy of self-restraint alone that keeps Israel from retaking Gaza immediately, legally, under International Law. As recently as last year, Professor Malcolm N. Shaw's 7th guide on International Law continues to speak of the lack of clarity in the matter of Succession. But he does state clearly that International obligations fall upon the new State. In Gaza, what new state are we discussing? The Arabs in Gaza still remain unaccepted as a legal nation, and therefore cannot accept Gaza legally unless they are accepted, Heaven fore-fend. With this in mind, let's analyze the most recent one state solution, that of Jerusalem Post editor Caroline Glick. She has written and spoken of annexing Judea and Samaria (the West Bank) immediately. She has even written a book on the topic. Caroline Glick's thesis is a world of improvement over current Likud policy of waiting indefinitely for leopards to change their spots and terrorists to repent. I would be happy if her plan succeeded, but optimally speaking, from a peacemaking perspective, in my opinion, it is not far reaching enough to achieve maximum peace. I wish to illustrate the difference between her proposal of annexation of the entire Judea and Samaria and the concept of annexing all territories Judea, Samaria and Gaza simultaneously, and also the concept of filtering naturalization applicants from pro terror elements as per the plan I suggested. My 'Kulam Marvichim, Everyone Wins' peace plan contains mechanics that could be beneficial even if the will of the people was to only annex Judea and Samaria. So it is worthwhile for fans of Everyone Wins to continue to share links and info on it where appropriate. However, there are some reasons to not settle for an edit to the plan. 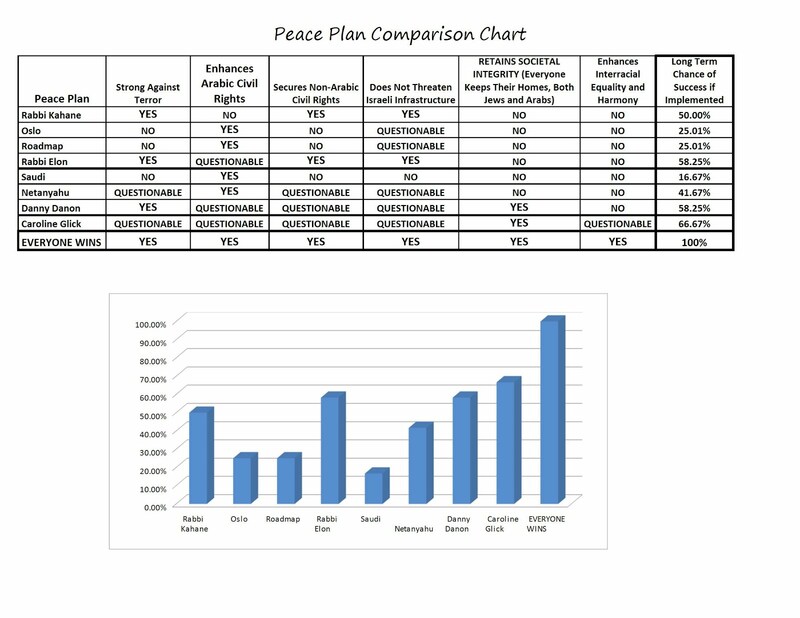 As I stated when I first wrote it in regards to Rabbi Elon's / Israeli Initiative / Jordan is Palestine peace plan, I would be happy if that would work, because no peace is worse than a less than perfect peace. But it is not politically viable to place your nation's national security in the hands of another parliament (Jordan). True peace is more important than personal accolades. So I urge my fans to not slander any true peace deal, even if not authored by me. The Almighty God shall reward our good efforts in any case. 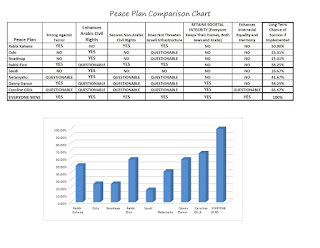 The main difference between Rabbi Elon's peace plan and Caroline Glick's is that Rabbi Elon's is not politically viable but is a full peace plan, while Caroline Glick's plan is a partial resolution of the peace problem, but is more politically viable. Everyone Wins is a plan in the middle of them, and still the path that I recommend as the way to go. For Everyone Wins is politically viable and resolves the conflict. 1) What about justice? We must not allow a terror state on Israel's doorstep to be established. Under my position on International Law, and the removal of Jews from Gaza several years ago, Gaza is still Israel's property. Gaza today is a province of Israel, under the governorship of the Palestinian Authority, awaiting ratification of the legal process of Succession which has never occurred. That means, if the law is like my position in this matter, it is then Israel's moral responsibility to stand up to terror under their watch and within their nation. Hamas must fall and by Israel's hand or at least approval, according to International Law itself. Why didn't George W. Bush attack Gaza before leaving office and get rid of the Hamas led pseudo government? Israel said no. 2) For those concerned with Halacha (Talmudic Law), there were two main perspectives discussed on Gaza. I'll say them in the name of two of the main rabbis of the previous generation, peace upon them, who supported those positions. One was the position of Rabbi Ovadia Yosef, which supported the surrender of Gaza for the sake of peace and protection of life. The other was the position of Rabbi Aharon Soloveichik, which opposed any land concessions as even a little would strengthen violence and bloodshed. With utmost respect to my mentor, Rav Aharon, I personally felt we should follow Rav Yosef's advice, on condition it was followed with common sense, i.e. that the Palestinian Authority would be founded in a manner of gratitude, not arrogant triumph. They would teach their children peace, not jihad. But that provision was not the path followed and therefore I returned back to Rav Aharon's position on the matter due to the poor implementation of the Oslo Accords by Rabin, Peres and Beilin. After the gift of Gaza was accepted with arrogant triumph that empowered years of terror, intifada and bloodshed, Rav Ovadia Yosef also withdrew his support of Gaza-for-peace. Therefore, there no longer exists a halachic mechanism to surrender the God given gift of parts of the Holy Land by any significant number of Rabbis. Whereas Everyone Wins remains halachically acceptable. If International Law of Israel's current possession of Gaza still remaining intact has been correctly stated by me, then there is no reason to not take back Gaza and accept God's gift. If the International Law is like Professor Kontorovich's previously stated position, and the land was already forsaken, then there may exist a halachic reason to allow passivity, in the retake of Gaza unless war or Moshiach decide otherwise, from this theoretical aspect. We are attempting to offer democratic life to the innocent among those who have tried to kill us, not by or for any evil by this annexation. This is the underlining belief in Caroline Glick's thesis as well, otherwise how can we even offer the suggestion of annexation? Therefore, it's merely a question of adding Gaza without being overwhelmed by the volume of naturalization applicants, which the mechanics of Everyone Wins handles well. Another strength of Everyone Wins is that it does not change the electoral balance in favor of Arabs, whereas Caroline Glick's plan slightly favors Arabs over other creeds and races in Israel by adding more Arabs than Jews in one lump sum to the State of Israel. If the West truly wanted a peaceful Palestinian State, it would have demanded that Palestinian Authority schools and media not irresponsibly indoctrinate their children with terrorists as heroes and bloodshed as a virtue. A majority of Palestinian Arabs have repeatedly called for violence against Israel. If you consider the Oslo Accords as an application for statehood. There simply is not enough virtue to consider it anymore. For the sake of it's own existence, Israel should not risk it. Support Jordan is Palestine for any who want their own country, if you like, but don't rely on Jordan is Palestine to end this conflict, for that is not likely to occur. A slow but sure approach to annexation, is a sure way to a slow relief from terror, we need to resolve this soon. But a slow but sure approach to naturalization of incoming Arabs from Judea, Samaria and Gaza (as in the Everyone Wins peace plan) is a sure approach to lasting peace. Annex the territories now with the provision in the law that Israel will naturalize the citizens there in a way that does not harm Israel's economy, infrastructure, or electoral balance. That works whether or not Gaza is included. In lieu of that, annexation of Judea and Samaria first, however less than ideal, may need to be the path to go, but with the mechanics of Everyone Wins in place. May the Lord of Israel enlighten us to the true path to peace. May it soon be so, by the grace of God.